Bringing together a very promising cast of Cameron Diaz, Leslie Mann, Kate Upton and Nikolaj Coster-Waldau (aka the King Slayer) and actor- writer- director Nic Cassavetes, The Other Woman might just be one of those movies that rises above the formulaic studio comedy by just having awesomely likeable people on screen. The Other Woman is in UK Theaters, the 23rd of April. It’s a Thursday night in London, there’s the cold, the wind, the rain, and the tube strikes to tackle if you’re going to get anywhere. But if you can brave the elements and the train unions, in a London Hotel Screening room somewhere in Soho, a glimmer of the spring ahead is on show. 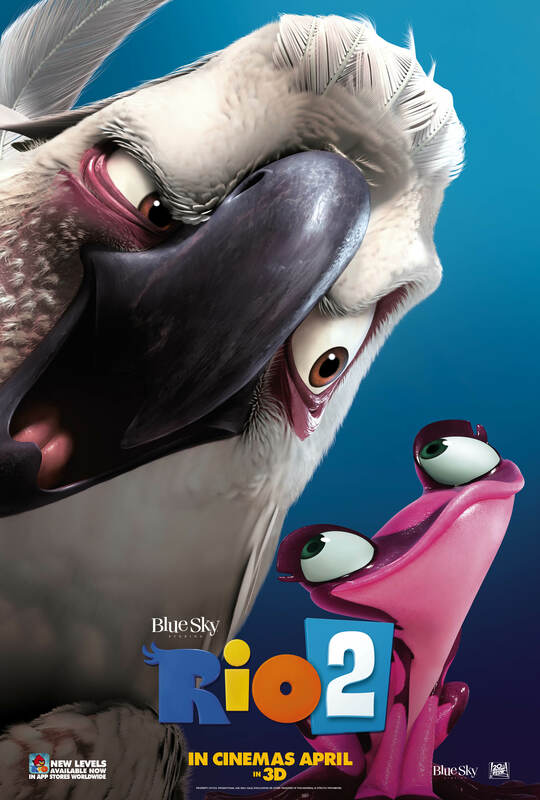 I’m talking about Writer/Director, Carlos Saldanha’s footage screening of Rio 2. 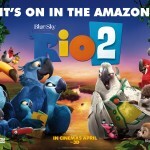 Now, two confessions; one – I haven’t seen the original Rio as yet -it’s a film that passed me by. 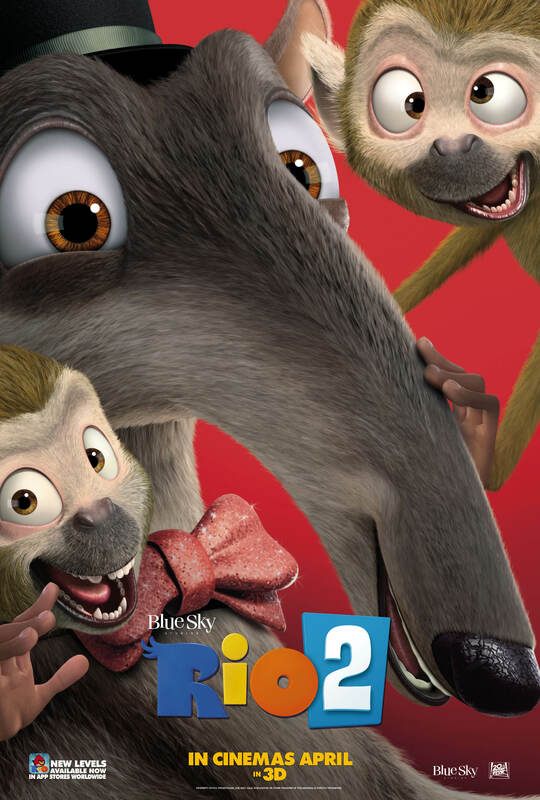 Like many CGI carton films, I always seem to forget how much fun they can be until someone picks me up and plonks me down into a cinema seat to watch one. I nearly always leave the better for it and then very quickly forget all over again how much I enjoy them until the next time I’m forced to watch one – it’s sort of like a much less interesting version of Groundhog Day. 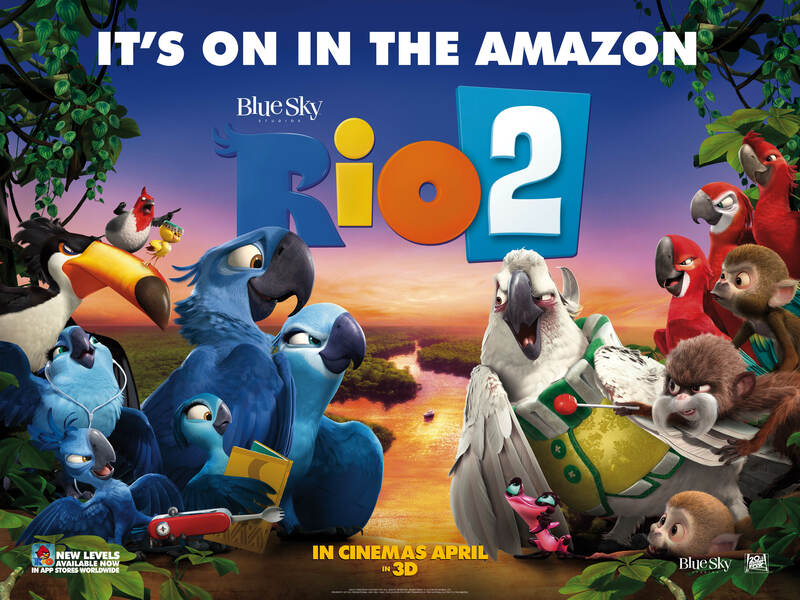 Having conquered Rio de Janero’s hustle and bustle in the first movie (thank you IMDB), Rio 2 moves our main characters away from the bright lights and big noise of the city and plunges Blu (Jesse Eisenberg) and Jewel (Anne Hathaway) into the Amazon rainforest in search of more Blue Macaws like themselves. This of course, leads to more trouble for our lovable, domesticized Blu, having thought he and Jewel were the last of their kind, he now discovers there are more in the wild and once again he is the outsider. 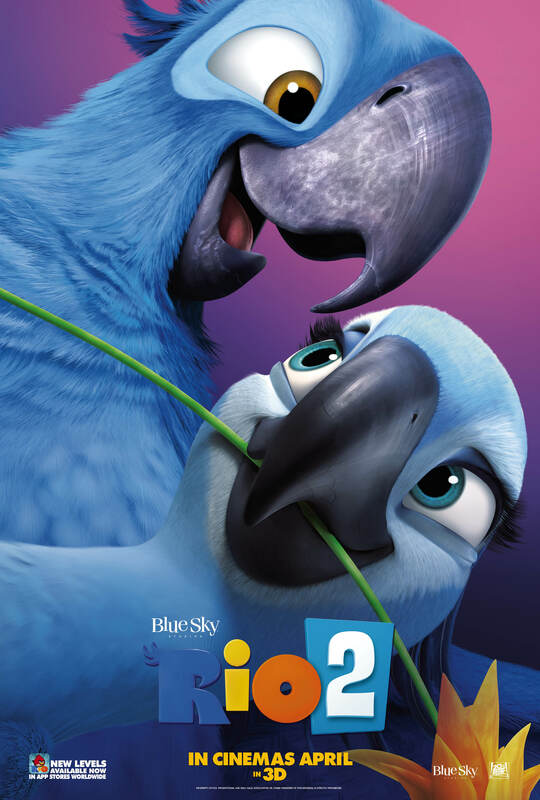 Having lived happily ever after at the end of the first movie, Rio 2 picks up with Blu as the family man… or family Macaw. He and Jewel now have the kids to think about – all three of them, and these aren’t the cutesy kind. Think – tying your babysitter to fireworks on NYE and you’ll be closer to the mark. 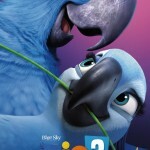 The new flock of Macaws are lead by the buzz-cut wearing, Eduardo, voiced by the always-gruffer-than-his-last-movie, Andy Garcia. He doesn’t trust human or their domesticized pets. He’s also Jewel’s father. Will Blu match up to his expectations as a son-in-law? Not with a fanny-pack in tow he won’t. If that didn’t make life tough enough, he also has to compete with Macaw-stud and fantastic-at-everything Roberto, (Bruno Mars), who’s introduction as a singing Casanova had everyone in the audience laughing out loud. Villain of the original Rio, Nigel the Cockatoo (Jermaine Clement) is back. The now-lame-winged bird is joined by Gabi (Kristin Chenoweth), the love-struck poisonous frog and Charlie the anteater. 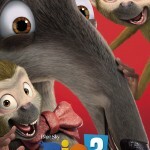 Together they follow Blu and family into the jungle to wreak revenge – although somewhere along the way get caught up in a Talent Competition. 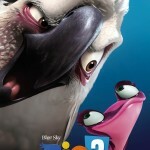 Rio 2 begins with a massive New Year’s Eve Party on Rio beach, setting the tone for a film filled with colour, music and ambitions to convey the real heart of Brazil. This continues with a macaw-style football match in the middle of the second act; they may be birds, but they still love the beautiful game. The most entertaining footage however was left to last; a ‘Jungle’s Got Talent’ sequence where all the competitors get to show off their unique skills… Just before being eaten up by the other competitors – that’s the jungle for you. This sequence culminates in Nigel’s finest as-yet-seen moment. A performance of I Will Survive, with added Jermaine Clement Free-Styling. And that was it. For now. It certainly left me wanting to catch up on the original before Rio 2 is released in the spring. 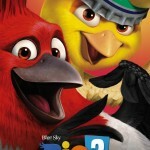 With some great looking animation, an exceptional cast and a fair few belly laughs in just the small amount of footage we saw, Rio 2, so far, is a movie worth looking forward to. Roll on spring time. 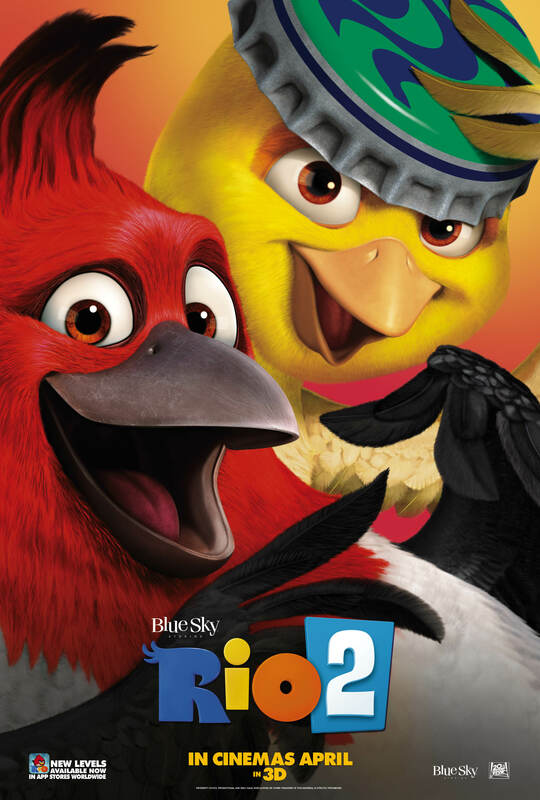 Featuring the voices of Anne Hathaway, Jesse Eisenberg, Leslie Mann, Jamie Foxx and Andy Garcia, Rio 2 flies into cinemas April 4, 2014.